The best cooking tips come from experience and educating yourself on what others have learned. Cooking has developed from prehistoric times when men ate raw foods to now when we lavish in gourmet foods. Today everyone eats cooked foods to some extent. Much time is concentrated now on teaching the best arts of cooking, whether it is in local small schools, universities or strictly culinary schools. These studies involve scientific studies to blend new flavors and to make food more digestible and palatable. Many of the best cooking tips come from trial and error. Through the years cooks have made many unsatisfactory products. By these mistakes some of the best cooking tips and wonderful recipes have been developed and documented. This is why it is good for younger cooks to listen to the advice and recommendations of older more experienced cooks. It is amazing what you can learn! The following list is of many that I have learned through my years of cooking. Some things may not register now, but if you read through the list eventually they will come up in your cooking. By using the best cooking tips, it will make your task much easier. If the recipe says to use a SLOW OVEN, it means a temperature of 250 to 325F degrees. If the recipe says to use a MODERATE OVEN, it means a temperature of 350 to 375F degrees. If the recipe says to use a HOT OVEN, it means a temperature of 400 to 450F degrees. If the recipe says to use a VERY HOT OVEN, it means a temperature of 450 to 500F degrees. Most recipes are written to make at sea level. Because the atmospheric pressure decreases as the elevation increases, adjustments are necessary in some recipes if they are used at high altitudes. The leavening power of baking powder and the boiling point of liquids are especially affected. A given quantity of baking powder has a greater leavening power at higher altitudes, so the amounts called for in recipes tested at sea level should be decreased. Baking guides for high altitude cooking are available from the government and often from your local state colleges. Liquids boil at a lower temperature as the elevation increases. What you think is a hot cup of tea because they water has boiled, is actually only lukewarm. Generally speaking, for each 960 feet above sea level the boiling point of the liquid is lowered by 1.8F degrees. Increase oven temperature 15F to 25F degrees for cakes and quick breads. Decrease each teaspoon baking powder by 1/8 to ¼ teaspoon. Decrease each cup sugar by 1 to 3 tablespoons. Decrease each cup of fat by 1 to 2 tablespoons. Increase each cup of liquid 1 to 4 tablespoons. Yeast rises more quickly so punch dough down and allow to rise 2 times before shaping. Beat egg whites to the soft peak stage rather than stiff peaks. Spray grater with non stick spray before using to grate cheese this will prevent sticking. Add salt last to milk because it often curdles it. Add a little cornstarch or the white of an egg to cream if it doesn't whip. When heating milk in a sauce pan rinse the pan with water first and it won't scorch as easily. Adding a pinch of baking soda to milk when making puddings or creams will keep the milk from curdling. Add a pinch of salt to beat eggs quicker. Always beat eggs before you add your sugar. This is the best cooking tip I have found to know if an egg is fresh; put it in a glass of water. Fresh eggs will sink to the bottom, they don't float. To keep unused egg yolks fresh for use later, place in bowl and cover with two tablespoons of oil, it will last 4 to 5 days. For fluffier scrambled eggs, beat in a small amount of water instead of milk. Add a pinch of baking soda to the egg whites before beating to keep boiled icing soft. Store cheese in a tightly sealed container and add sugar cubes to prevent mold. Cheese should be served at room temperature which is 70 degrees. To make sweet cream sour add 2 teaspoons lemon juice or 1 teaspoon vinegar to each cup. To make sweet milk sour add 2 tablespoons lemon juice or vinegar to each cup. To whip evaporated milk place can in freezer until partially frozen; pour into a very cold bowl and add 1 tablespoon lemon juice to 2/3 cup of milk. To cut hard cooked eggs without breaking the yolk dip sharp knife in water. To make boiled eggs easier to peel simply pour off boiling water and quickly cool down with cold water or ice. When preparing a casserole make an additional batch to freeze for a quick “short on time” dinner. Use within 2 months. Soufflé dishes are made with straight sides to help the soufflé rise; ramekins work well for single serving casseroles. 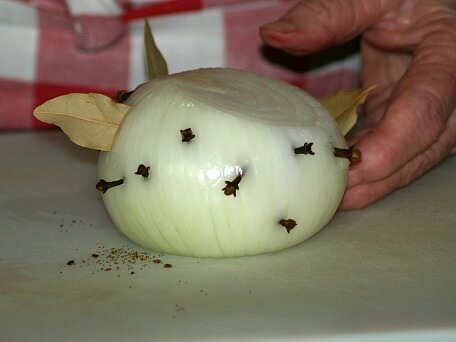 To make it easy to remove cloves and bay leaves from soups, stews and sauces, press them into an onion. Drop the whole onion in the pot and after cooking lift it out with a slotted spoon or tongs. To increase the amount of juice squeezed out of a lemon put it in hot water for 15 minutes. Rub the cut side of an onion with butter to keep it fresh longer. Cooking celery with other vegetables such as cabbage or broccoli will prevent strong odors. Put overripe fruit in a blender with fruit juice to make popsicles; freeze in paper cups and add sticks. When cooking vegetables, cover the ones that grow underground and the ones that grow above ground leave uncovered. Canned fruits need to be opened an hour before serving the flavor becomes richer after absorbing the oxygen. Pineapple and its juice should be scalded before you combine with gelatin or it won't set. Cooked potatoes piled together will sour more quickly. To keep vegetables fresh place them in a deep dish with two inches of cold water cover with clean towel soaked in water set where air will blow over it, make sure towel stays moist. The best cooking tip that I have found and I use is to wrap vegetables like celery in dry paper towels; place them back in a plastic bag and they stay fresh longer. When cooking collards, add a washed, unshelled pecan to the pot before turning on the stove, this will eliminate the smell. Red potatoes are always good to keep on hand; they make a superior product in any potato recipe. Add butter or margarine to cooking water or grease the rim to keep starchy vegetables foam from boiling over. To make orange or grapefruit segments pare with a sharp knife blade along each segment wall to center and turn out segment with a slight twist of the knife. To peel oranges and grapefruit easily let stand in boiling water about 8 minutes before peeling. To keep lemons fresh place in glass jar fill with water and cover tightly. To keep cut fruits from discoloring sprinkle lemon juice over them. Never soak vegetables which have been sliced; they will lose much of their nutritional value. Green peppers may change the flavor of frozen casseroles. Clove, garlic and pepper flavors get stronger when frozen while sage, onion and salt become milder. For a no mess side dish grill vegetables along side of your grilled meat. When cooking greens add a teaspoon of sugar to the water to help vegetables retain their fresh color. To dress up buttered cooked vegetables sprinkle with toasted sesame seeds, toasted nuts, canned French fried onions, grated cheese or slightly crushed seasoned croutons. To avoid toughened beans or corn add salt midway through cooking. Keep strawberries fresh for up to 10 days by storing them unwashed in an airtight container between layers of paper towels. Use a new toothbrush to brush off grater when grating citrus peel. To core a pear slice in half lengthwise and use a melon baller to cut out the central core using a circular motion. Draw the melon baller to the top of the pear removing the interior stem as you go. To bake potatoes more quickly, place them in boiling water for 10 to 15 minutes; pierce skins with a fork and bake in a preheated oven. If you are feeding a family, when baking potatoes, bake extras. They make a delicious and quick meal by simply adding crumbled bacon, cheese and other condiments. If you are running low in your grocery budget, keep potatoes in the kitchen; they make great meal extenders at a low price. Wild meats should be cooked with onions to temper the flavor. The best cooking tip I learned from my dad is that wild game can be soaked in salt water to remove gamey flavor. Meat and chicken can be floured easily by putting flour in bag and shaking. To make fish firm when boiling add a little lemon juice to water. To keep bacon from curling snip edges with kitchen shears. To keep bones on crown roast from burning place in pan with bones down or spear ends of bones with fat meat. When preparing small bits of meat place them on skewers. Turn a metal colander upside down over frying pan to keep fat from spilling out but steam can escape. One of the best cooking tips for excess grease in soups is, drop in a lettuce leaf and it will absorb all the grease; keep repeating until desired amount is gone. Keep all grease that you can't use for cooking and make lye soap with it for cleaning purposes. Spray (with an oily non stick) or grease your kitchen scissors before cutting to keep from sticking. After frosting your cake if you cover with plastic wrap first spray with an oily no stick spray, so icing won't stick. To keep hot oil from splattering sprinkle a little salt or flour in the pan before frying. Sometimes chocolate “seizes” (clumps) caused by a drop of moisture getting in the pan. The cooking tip if this happens is, before throwing it out try stirring in a little cooking oil or shortening (1 tablespoon per 6 ounces of chocolate). Sometimes the extra fat will smooth it out. When making rice always cook extra it can be used for desserts and puddings. Pinch of rosemary added to the water when cooking rice gives a nice flavor. Dry beans cook much quicker and are more tender if soaked in fresh water overnight. To prevent pasta from boiling over place a wooden spoon or fork across the top of the pot while the pasta is boiling. If pasta sauce seems a little dry add a few tablespoons of the pasta cooking water. Rub the bottom of a soup cup with sliced fresh garlic to accent the flavor of Navy bean soup. When baking, always preheat oven to temperature required unless specifically requested to begin with cold oven. When baking, always make sure your oven is ready before you start mixing ingredients. When baking, combine dry ingredients together first. The cooking tip to get lighter cakes, muffins, or biscuits, alternatively add flour mixture with milk to egg mixture. When baking a double crusted pie, place pie on a hot cookie sheet during preheating so the bottom crust will bake through, to get a shiny crust brush top with milk, sprinkle with granulated sugar or sugar and cinnamon mixture for sweet crust or brush lightly with a beaten egg for a glazed crust. When baking to get a lighter texture add a teaspoon of baking powder to any recipe that uses self-rising flour or cornmeal. To bake your own party crackers cheaply, simply take ordinary soda crackers, spread on a cookie sheet, and brush with butter or egg whites and add toppings. Bake at 400 degrees until brown. Toppings suggested are sesame seeds, poppy seeds or seasoned salt. To evenly frost a baked cake, pin a piece of stiff paper, doubled up, about the cake extended about an inch above the top, remove after icing has set. To bake breadsticks use inexpensive biscuits that come in a tube, part each biscuit into fours shape as desired on a cookie sheet, brush with butter or egg whites, add toppings as desired and bake till brown on both sides. Dampen the edges of your pie crust before baking to keep them from becoming too brown. To eliminate the use of flour when you roll out your pie crust you can place in a plastic bag. Bake for 10 minutes cinnamon on a sheet of foil to eliminate any odor and give off a pleasant scent. Icing baked cookies with a one inch paint brush is much faster. To prevent meringue from shrinking on pie spread all around the edges touching the crust. When preparing several batches of pie dough roll dough out between sheets of plastic wrap; stack in a pizza box and keep in the freezer. Pull out crusts as needed. Place pie plate on a cake stand when placing the pie dough on it and fluting the edges; cake stand makes it easier to turn the plate and you do not have to stoop over. Use kitchen gadgets for decorating pie crusts; spoon for a scalloped edge, fork for crosshatched or herringbone pattern or a bottle opener to cut out points around rim. Cut butter into small pieces before adding to the flour and cutting in. To ensure you have equal batter in your layer cake pans use a kitchen scale to weigh it out. To achieve a silky molten look on professionally looking cakes use a hair dryer after frosting the cake; a little heat will slightly melt the icing making it have a smooth look. Use a heat safe zip lock bag to decorate a cake with chocolate. Put chocolate in the bag and immerse in hot water until chocolate melts. Cut off one corner and squeeze chocolate out to decorate. To toast coconut for cakes put in pie pan and place in a moderate oven; stir often to brown evenly. Flour for cakes should be sifted once before measuring; fill cup without packing. When beating egg whites do not tap beaters on bowl of egg whites. The jarring of the beater will cause the whites to lose a great deal of the fluffiness. Eggs should be between 3 and 14 days for using in cakes. Add a little vinegar to the water which you rinse your nylon hose in to increase elasticity and decrease runs in them. After baking while your oven is still warm wipe it out with a cloth of vinegar to cut cleaning frequencies. Put vinegar in a new frying pan and bring to a boil this will prevent food from sticking. Add a little vinegar to whatever you are washing to remove soapy film. Boil some in a pan to remove a bad smell. A teaspoon of vinegar to poached eggs will keep them from separating. One teaspoon of vinegar in icing will keep icing from breaking when it is cut. Tenderize meat by using vinegar and olive oil, rub both sides and let it set for at least two hours before cooking. A little vinegar or lemon juice added to potatoes before draining will make them extra white when mashed. To prevent bug outbreaks in flour ingredients, place all flour and pastas in freezer for two weeks; take out and store in sealed food containers. Store leftovers in the foil pans that pies come in, coffee can lids usually fit for great stacking, plus you can reheat in foil pans. One way to store herbs for quick later use is to blend with water and freeze in an ice cube tray. Place in a bag or container when frozen. Later they can be added to soups or stews. Seeds and nuts whether shelled or unshelled store best in the freezer. They can be used directly from the freezer. Popcorn should always be stored in the freezer it stays fresher and eliminates bugs. Never throw out unused chicken stock or vegetables, these can all be frozen and used later in soups and sauces. Never wrap bread in cloth, as it will absorb moisture and alter the taste. To reheat muffins biscuits or rolls, place in a pan and place that pan in another pan filled with water and put in oven; they will turnout soft. To make bread crumbs from dry bread place in cloth sack and roll with rolling pin. Store dried pasta, white rice (not brown), and whole grains in tightly covered containers in a cool dry place. Refrigerate brown rice and freeze grains if you will not use them within 5 months. Do not freeze COOKED egg whites; they will become tough. When freezing foods label each container with the contents and the date it was placed in the freezer. It is best to store frozen foods at 0 F degrees. It is best to use cooked foods within two months. Using these best cooking tips will enhance all of your kitchen endeavors! I add to these cooking tips often so be sure to bookmark this page. Don't see a cooking tip you need; just send me a note using my contact form.